As I have mentioned in a few other posts, I've been researching the history of 205 W. McMicken in Over-the-Rhine. Beginning in 1908, a number of chairs, stools, basins, mirrors and, of course, scissors, were carted into its first floor. Under the ownership of Frank Clusin, the space was to become a barbershop. This post examines what barbering was like in Cincinnati in the early 1900s for men like Frank. The typical interior of a barbershop in Cincinnati in the early 1900s. Note the Union card hanging on the wall. Courtesy of Blegen Library, University of Cincinnati. Frank's barbershop at 205 W. McMicken lasted until the early 1920s; thereafter, barber Fred Wolf ran his shop out of the storefront during Prohibition; and during the Depression into World War II, Raymond Dayton and James Ball used the first floor for "Dayton and Ball Barbers." It may go without saying but barbering then and now is a job based exclusively on customer service, and barbers—either owners of a shop or employed in a shop—understood, perhaps more than other professions and laborers, that their business relied on a waiting public. Literally, men queued to have their faces shaved and hair trimmed; other men, non-customers, sat in the shops too, for a social hour and gossip. Journalists congregated, eager to engage an idle group of people. All of these people just watched the barber at work—that's a lot of pressure. Cincinnati barbers during a Labor Day parade sometime in the early 1900s. Courtesy of Blegen Library, University of Cincinnati. Furthermore, in the early 1900s, there was a surplus of barbers, so men understood the importance of getting and keeping clients—of having excellent customer service. 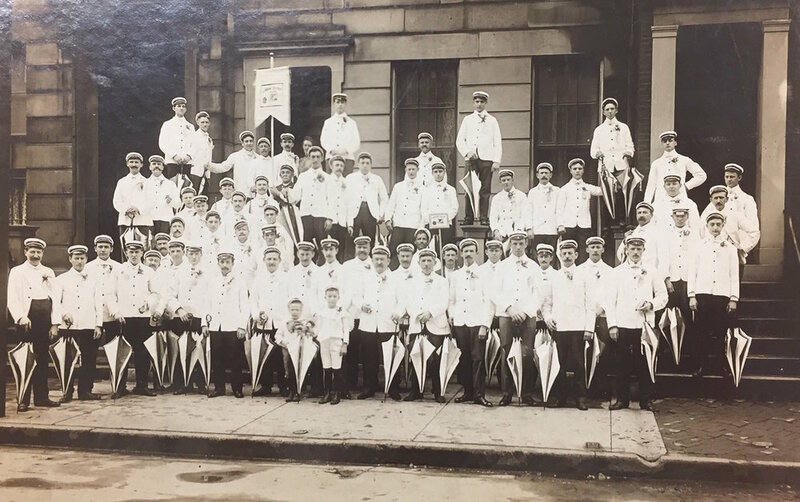 This surfeit was the result of an unprecedented number of immigrant and native-born white men like Frank Clusin joining the barbering trade around the turn of the 20th century. Barbers listed in the 1915 city directory—and this isn't even all of them! Courtesy of the Public Library of Cincinnati and Hamilton County. In joining the trade, many of them purchased the latest furnishings for their shops. These improvements, plus the advent of barbers’ unions and growing state regulation of shops, all contributed to the displacement of Black barbers from primary locations downtown and in nearby neighborhoods like Over-the-Rhine to Black business districts and neighborhoods like the West End. Many Black barbers could only serve white clients due to the color-line in barbering. Courtesy of Collectors Weekly. Throughout the 19th century, barbering was considered a feminized, unskilled profession—feminine because personal appearance as being attended to and unskilled because so many Black barbers existed and cut the hair of white men. White men considered the work unfit for their race and refused to attend barbershops in which the barber also shaved a man of color. This led to a strong color-line in barbering, to the point that Black barbers had to refuse to service men of their own race at the same shops where they had white customers. For sure, Black men could receive “shaving time” at Black-run shops in their neighborhoods and business district. These were important spaces for men to congregate and talk, often of discontentment. Indeed, after the Civil War, many African American men became more vocal about Black barbers who only waited on white customers. It was one among too many signs of Jim Crow segregation. An early 1900s Gillette at-home razor advertisement. Courtesy of RazorArchive.com. Why did so many immigrants, especially Germans and Italians, decide to get into the barbering game around 1900? Part of the list of registered Union barbershops in Cincinnati, as of July 1st, 1918. Courtesy of Blegen Library, University of Cincinnati. Barbering prices as of 1907. Courtesy of Blegen Library, University of Cincinnati. Placard that hung in Union shops. 205 W. McMicken would have had one. Courtesy of Blegen Library, University of Cincinnati. Not all Black barbers wanted to join the JBIUA. In fact, many saw the JBIUA as just a tool for white men to claim some kind of professional monopoly over non-union, less regulated, often Black-run shops. JBIUA was on a mission to make barbering more rigorous and in particular, it hoped to capture the confidence of public health reformers who also sought to shut down “unsanitary” barbershops. Scientific articles began to purport the numerous contagious diseases found at the barber, including syphilis and tuberculosis—TB maybe, but especially things like lice, scabies and skin infections were passed around at some barbershops. The move to better sanitize them coincided with larger medical and public health efforts around the turn of the 20th century to improve urban quality of life in general (you can read more about these efforts among reformers and physicians in Cincinnati here). The JBIUA publication. Courtesy of Blegen Library, University of Cincinnati. One of the ways that Union shops encouraged customer loyalty. Courtesy of Blegen Library, University of Cincinnati. Racially-charged accusations alleged that Black shops were unkempt and ignorant of the above-mentioned professional standards. This underscored how mainstream white America often racialized sexually-transmitted and other diseases—that Black men and women were more likely to be contaminated—as a way to manage relations between races and as a way to hurt Black business. George Myers. Courtesy of TeachingCleveland.org. [i] Ohio Marriages, 1800-1958, FamilySearch.org; 1850 Federal Census, FamilySearch.org; World War I Registration Card, Familysearch.org; 1910 Federal Census, Ancestry.com; Kentucky, County Marriages, 1783-1965, Ancestry.com; U.S., Social Security Death Index, 1935-2014, Ancestry.com. [ii] Quincy T. Mills, Cutting Along the Color Line: Black Barbers and Black Barber Shops in America (Philadelphia: University of Pennsylvania Press, 2013), 108-125. [iii] Mills, Cutting Along the Color Line, 118-119. [iv] Mills, Cutting Along the Color Line, 108-125; J. M. McCamant, Mack’s Barbers’ Guide: A Practical Hand-Book (Ogden, UT: Wasatch Publishing, 1908), 93. [v] M. T. Smith and Joseph Meyung, Journeymen Barbers’ International Union, “Brothers in Union: Greeting!” August 24, 1914, Barbers’ Union Local #49 Papers, Vol. 1, Folder Minutes 1913 Feb. 4, Archives & Rare Books Library, Blegen Library (hereafter BL), University of Cincinnati, Cincinnati, Ohio. [vi] “By-Laws of Local Union No. 49 J.B.I.U. of A,” September 6, 1907, Barbers’ Union Local #49 Papers, Folder 5, BL. [vii] “The Story of Local 49,” Barbers’ Union Local #49 Papers, Folder 7, BL. [viii] Ronald S. Barlow, The Vanishing American Barbershop: An Illustrate History of Tonsorial Art, 1860-1960 (El Cajon, CA: Windmill Publishing Company, 1993), 12-13. [ix] Sidney Coyne Thorpe, The Modern Guide for Barber Instructions (New York: Milady Publishing Group, 1945), Barbers’ Union Local #49 Papers, Folder 14, BL. [x] Mills, Cutting Along the Color Line, 125-129; Barlow, The Vanishing American Barbershop, 15. [xi] Quoted in Mills, Cutting Along the Color Line, 115, 129-141. [xii] Hunter Oatman-Stanford, "Straight Razors and Social Justice: The Empowering Evolution of Black Barbershops," Collectors Weekly, May 30, 2014, https://www.collectorsweekly.com/articles/the-empowering-evolution-of-black-barbershops/.